If you want to learn how to completely avoid shoulder pain when benching, then you need to read this article. However, despite its effectiveness, it’s also the one exercise that lifters seem to have the most trouble with…. …this is primarily due to shoulder pain during the bench press or after the movement. And in many cases, this is simply a result of various tweaks that need to be made in your bench press form. In this article, I’ll go through exactly what those tweaks are so that you can minimize your risk of injury overtime and get back to pain free bench pressing as soon as possible. The first bench press form mistake is something most people are aware of yet tend to have trouble properly implementing. Whenever we’re benching, we want to have our shoulder blades retracted or pinched together as if you were going to pinch a pencil between those blades. The head of our humerus to properly track throughout the press. Better activate the chest by minimizing involvement of the front delts. If we don’t have the shoulder blades retracted, what actually tends to happen is the upper arm will round forward. This can irritate some of the rotator cuff tissues in the front of the shoulder. Depress your upper traps by bringing your shoulders down and away from your ears. This takes the upper traps out of the movement and also creates more space within the glenohumeral joint. Pinch your shoulders blades together as previously discussed. You want to then maintain this tightness by actively squeezing your shoulder blades together as you perform the movement. And avoid the common mistake of opening up the shoulder blades and losing tightness at the bottom or as you push up. 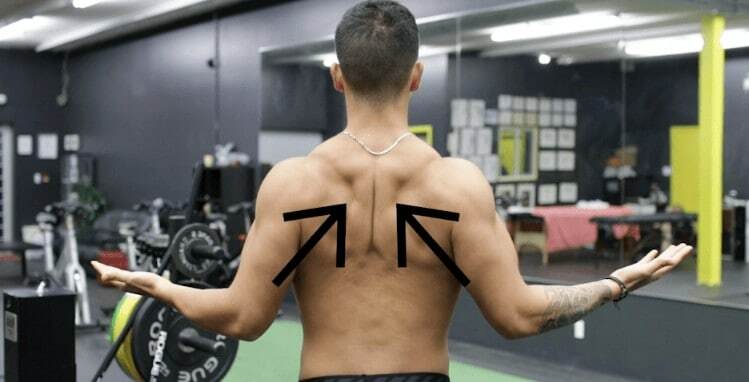 If you struggle with this, I’d suggest trying this “shoulder blade retraction exercise” out. The feeling you get here is the exact feeling you want to achieve while performing the bench press. So what you can do is perform that exercise immediately before setting up for the press. And then practice maintaining this feeling when benching by using lighter weight and gradually building up towards your working weight. Another common benching mistake that can cause shoulder pain is pressing with a completely flat back. And the reason for this is similar to what we saw with retracting your shoulder blades. As a slight arch in the upper back places the glenohumeral joint in an externally rotated, safer position. 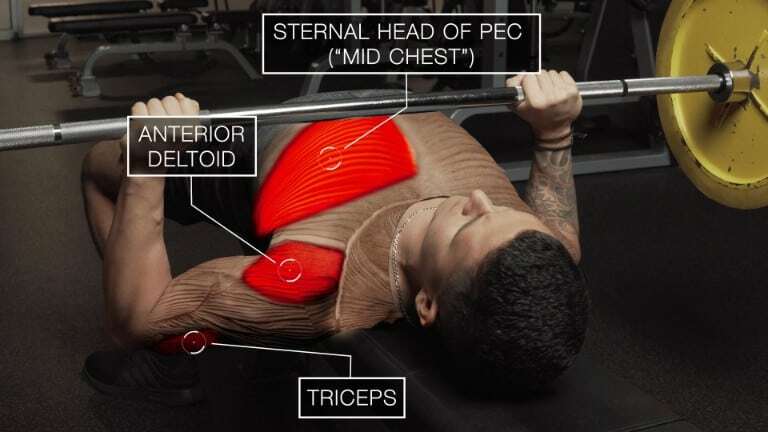 Meaning that it effectively avoids putting your shoulders in a dangerous internally rotated position at the bottom of the press, which commonly occurs when pressing with a completely flat back. But to properly implement this while avoiding injury, note that you’re not simply arching your lower back. Maintain this arch as a solid base of support for your press. Properly implementing the above three step process to your bench press form will drastically improve the shoulder pain you experience when benching. One of the most common bench press form mistakes people make is touching the bar too high on their chest at the bottom position. How does this contribute to shoulder pain when benching? Touching the bar too high on the chest with the elbows flared out increases the compressive forces at the clavicle and increases the net torque placed on the shoulder. And as a result, this quite obviously increases the likelihood of you experiencing shoulder pain when benching. So what you want to do is instead realize that the bar path of your bench press shouldn’t be straight up and down. Simply meaning that the bar path should be curved diagonally, and you’ll be pushing slightly backwards rather than straight up and down. Such that your elbows remain closer to the body and more or less directly under the bar throughout each rep. This will not only lead to a safer press, but a stronger one as well. This creates unnecessary torque on both the elbow and the shoulder joint, likely contributing to your shoulder pain when benching. And to fix this, there’s two things you need to do. 1. If your elbows are unaligned when viewed from the front or back, then the problem is likely with your grip width. And, as stated in this review paper analyzing the shoulder joint, is problematic since it increases the demand placed on the rotator cuff. 2. If your elbows are unaligned when viewed from the side, then it’s likely that you’re not properly tucking your elbows. This mistake is often a result of “overtucking” your elbows too close to your sides when you press. You’ll likely have to play around with the degree of your elbow tuck in order to find what both feels best and enables your elbows to remain stacked under the bar. I’d also highly recommend videotaping yourself performing the bench press from the side and from the back. This can help you visually see small errors you’re making and correct them. But regardless, try implementing the tips I mentioned as they lead to not only a safer press, but a stronger one as well. As I always try to emphasize, it’s absolutely vital that you pay close attention to how exactly you perform your exercises in order to prevent injuries overtime and to progress faster. As I say quite often, if you want to see the best results then it’s vital that you choose the right exercises and variations. But, even more importantly is that perform these exercises in a way that enables you to progress the fastest and avoid injury overtime. If you’re serious about transforming your body, then BOTH your training and your nutrition needs to be optimize based on your specific starting point. This is what is going to enable you to progress at the fastest rate and is why thousands of members are experiencing incredible results with the #BuiltWithScience programs. Within my programs you’ll have access to weekly workouts, a powerful nutrition software, in depth exercise video tutorials, meal plans, a private Facebook group, and so much more. Take The Starting Point Quiz Here! Anyways, that’s it for this article – hope you enjoyed it and found it useful! Don’t forget to give me a follow and connect with me on Instagram, Facebook, and Youtube as well to stay updated with my content. Cheers! Thank you for this explanation. I’ve started my powerlifting training about two months ago and my first met is in two weeks. My bench press is the strongest lift but with this description I can effectively work on my set up. My coach already explained and showed me how and corrected me tremendously, I still like to know more about the technique and the different studies about it. I like your scientific approach, so thank you. I will work on my technique further.